Everyone is nothing but cheerful during the cherry blossom season. The air is filled with the delicate fragrance of the cherry blossoms and it's a great time to say goodbye to the cold winter season and embrace the spring. Watching the beautiful cherry blossoms is a tradition from Japan, where the people are celebrating the so called 'Hanami' witch family, friends or collegues. 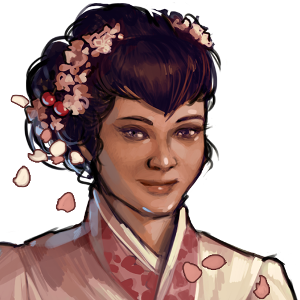 Therefore you can win buildings from the magnificient cherry blossom set in a traditional japanese design during our Spring Event. Build them right next to each other to unlock their true potential! Each of them gets more powerful for each other unique Cherry Garden next to it. 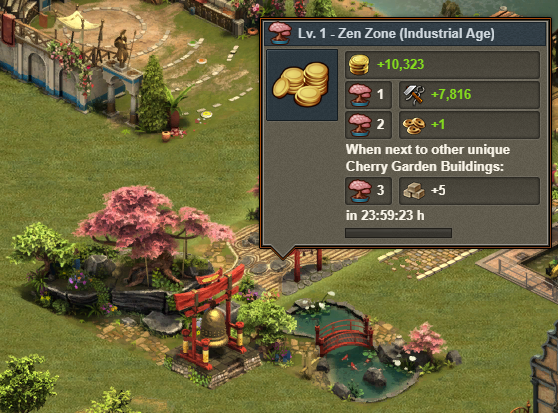 The more unique Cherry Garden buildings you build next to each other, the higher their bonus will be! Try to win all of them in this year's Spring Event. 1 How does the Spring Event work? How does the Spring Event work? 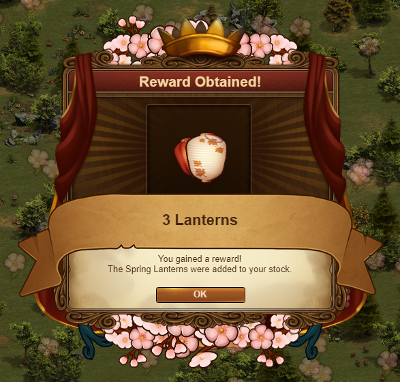 During the event, a new resource will be added to the game Spring Lanterns! 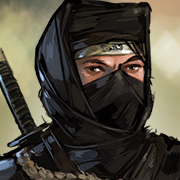 Win them by solving quests and collecting cherry trees outside of your city. 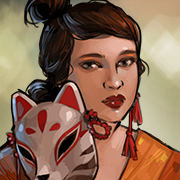 Every day the questgiver Hanako will have a quest for you, granting you some Spring Lanterns for free. Every time you open a chest or complete an event quest and once a day, a new tree will spawn. The amount of Lanterns you will get from each tree is random and ranges from one to ten. Naturally, trees with a single Lantern will be the most common ones, and you have to be lucky to get ten! The Lanterns can be traded for chests. There are three of them: bronze, silver and gold. Each of them contains different rewards and you have to pay with Lanterns to get one of them! There is also a daily special prize and the Chests will include a certain chance to win it. Every time you open a chest you win Cherry Blossoms, which will give you the opportunity to win an extra Grand Prize. During the Spring Event you can get buildings from the Cherry Garden Set, which can also be upgraded once to a second level. Note: One-Story Pagoda is not a part of the Cherry Garden set, and can not be upgraded. 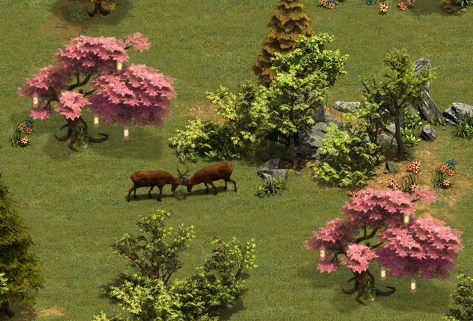 All buildings of the Cherry Garden Set are marked with a Sakura Tree, as an indicator. If you group them together (Pagoda is a standalone building and is not a part of the set) you will get certain additional bonuses! That's because all the buildings visible above have a "Set" building skill. When a building with a set bonus is built right next to another (different) building from that specific set, it gets a bonus. 1. Produce additional supplies (when touching at least one). 2. Produce additional Forge Point (when touching at least two unique buildings). 3. Produce additional goods (when touching at least three unique buildings). The bonuses add up, so when touching two other buildings, you get bonus for both 1 and 2. Detailed amounts will be shown in tooltips, when hovering over the new buildings. The level 1 and level 2 of one building, e.g. the Zen Zone don't count as unique buildings. In order to bring one of the Cherry Garden Set Buildings to the next level, you will need the unique upgrade kit for each building. You can get those upgrade kits during the Spring Event Questline or through a selection kit, which can be won as a daily prize. With the selection kit you can decide yourself, if you want to build the level 1 version of the building, or get the upgrade kit to bring it to level 2. Choose "Build" and you can directly place the building in your city. Choose "Upgrade" and you can upgrade an existing level 1 building in your city. 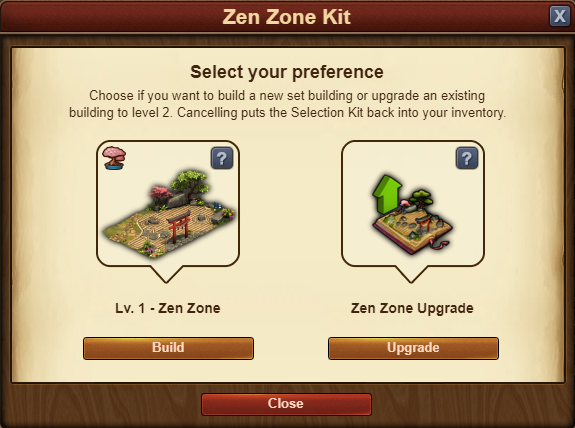 Be aware, that you can only use the Upgrade Kit for level 1 buildings of the set and only for the displayed building. For example: The Zen Zone Upgrade Kit will not upgrade the Sakura Rock. Only the Zen Zone. Esta página foi modificada pela última vez à(s) 14h25min de 24 de março de 2018.